Emergency and disaster management briefing for April 8, 2019: Three people are dead and three firefighters injured after a collision involving a fire truck in Phoenix; severe storms that impacted Texas on Saturday and Sunday knocked out power and flooded roadways; Fisher-Price is issuing a warning to parents regarding its Rock 'N Play Sleeper; firefighters and first responders encounter increased unique challenges when addressing hybrid and electric car crashes and fires; a norovirus outbreak has occurred at a Washington, DC children's hospital; a drive-by shooting during a family gathering in a Southside Chicago neighborhood injures at least six, including two children; a guide to address emerging wildfire threats due to urban creep and increased drought that has placed new communities at-risk for wildfires is available to first responders; and a Texas State Trooper is in critical condition after being shot multiple times by a suspect who fled from a vehicle crash. 1) Three people were killed and three firefighters were injured after a collision between a pickup truck and a fire truck on Sunday. According to officials, the pickup truck allegedly turned left in front of the Phoenix Fire Department truck while it was en route -- with sirens and lights -- to an emergency call. Witnesses described the collision as being like an explosion; the deceased included one adult male, one adult female and a six-month-old baby. 2) Texas was hit with another round of wet weather Sunday, following a possible tornado touchdown in San Gabriel on Saturday. A round of severe thunderstorms on Saturday likely produced the tornado, which was seen by storm spotters and residents before it damaged two churches, including destroying the roof of one church. The severe storms also knocked out power to at least 158,000 homes and businesses, caused the cancellation of 370 flights in Houston and Dallas, flooded roadways throughout the region, and prompted swift water rescues near San Antonio. 3) A new warning has been issued by Fisher-Price regarding its Rock 'N Play Sleeper, after another baby died last month while using the product. A total of 10 babies have died since 2015 while using the product -- all of them older than three months and all of them were in the device unrestrained -- both things for which the product carries a warning label. A full recall has not been issued for the product, and Fisher-Price noted that the product meets international safety requirements -- with warning labels that clearly state the device is not for use for babies that are over three months old and/or who have learned how to roll over. 4) Firefighters and other first responders are encountering increased challenges when faced with electric vehicle fires. 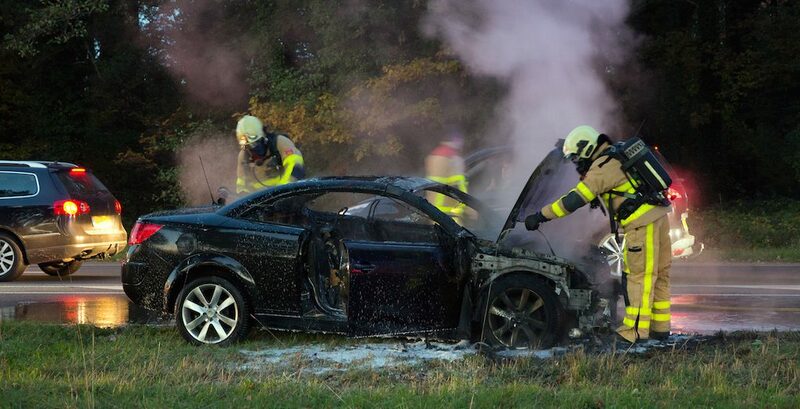 The new lithium-ion batteries that power hybrid electric vehicles are tricky to handle when they catch fire, can take massive amounts of water to extinguish, and can reignite repeatedly over days and weeks. Traditional methods and tactics used to extinguish gasoline fires may actually make the situation worse and post-fire storage is critical. The National Fire Protection Association (NFPA) offers a free Alternative Fuel Vehicles Safety Training, along with other resources for addressing hybrid and electric vehicles involved in a crash. 5) Three patients at a Washington, DC children's hospital have tested positive for the contagious norovirus. The outbreak of the contagious virus occurred Saturday after patients on the second floor of the Hospital for Sick Children Pediatric Center tested positive for the virus. The hospital has since implemented methods to prevent the disease spread, including visitor restrictions, and is closely monitoring other patients for any signs and symptoms of the virus. 6) A drive-by shooting in a Southside neighborhood in Chicago on Saturday evening left at least six people injured, including two children. The shooting occurred during a family gathering, and an 8-year-old boy was shot in the back and chest, while a 10-year-old girl was shot in the shin. Both children were listed in stable condition at a nearby hospital. According to officials, there was little physical evidence to process at the scene, and witnesses were not cooperating with authorities. 7) For the first time, federal wildfire suppression costs topped $3 billion nationwide in 2018, with major California wildfire losses at $9 billion. Although wildfires are low-risk, they are high-impact events and at-risk communities need to be prepared. Urban creep and increased drought has placed communities at risk that never were before, and preparedness is key to early warning and saving lives. The Wildland-Urban Interface Chief's Guide is now available to help fire officials plan and prepare for the emerging risks of wildfires using the four phases of emergency management: preparedness, response, recovery and mitigation. 8) A Texas State Trooper was shot multiple times Saturday evening by a suspect who fled the scene of a vehicle accident on foot. The trooper was shot multiple times after he located the suspect, Victor Alejandro Godinez, who was later apprehended in Edinburg early Sunday morning. The trooper, who has not yet been identified, underwent emergency surgery and was listed in critical but stable condition on Sunday.